Teen Choice Awards Causes Twitter Uprising! Last night was the (highly anticipated?) 2014 Teen Choice Awards on Fox. For weeks, we've seen celebrities of all kinds (TV, movies, musicians, youtubers AND viners) who were nominated for an award reach out to their fans encouraging them to vote. But last night, several tweets were sent out bringing the entire awards show into question. At least for the teenagers out there who voted and felt like they weren't heard. 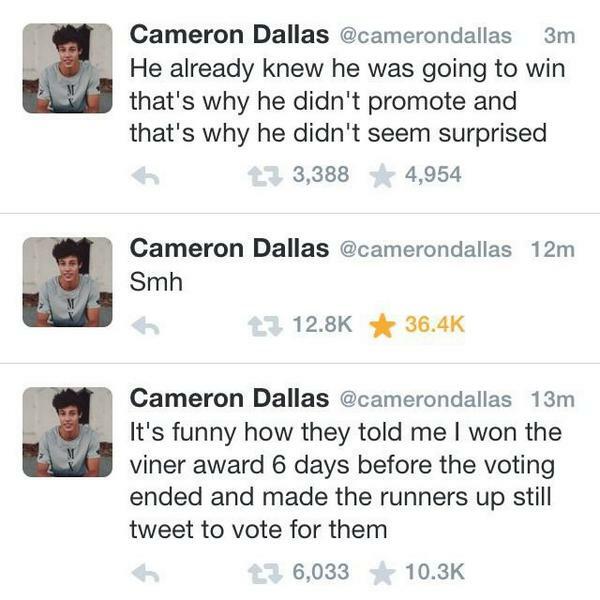 Viner Cameron Dallas who actually won Choice Viner over Matt Espinosa, Jack and Jack, Shawn Mendes and Lele Pons tweeted out his distaste for the awards show during Tyler Oakley's speech for winning Choice Web Star. First he tweeted that he already knew he was going to win 6 days before the awards show, followed by "smh" (shake my head) and why he believed Tyler Oakley didn't seem surprised by his win. Other Viner, Matt Espinosa jumped on the bandwagon and tweeted, “Basically they picked the people almost 6 days before voting was done and used all of us for promotion." By now all of these tweets have been deleted. But sadly the wounds have already cut too deep. I hate how the Teen Choice Awards are rigged. Its like our vote didnt count and it should. Unfortunately this really shouldn't be a surprise to anyone. Despite how many times teens voted, at the end of the day producers of the show have the legal right to pick the winner. It's all right there above in the fine print. In the producers defense, the reasoning behind letting the winners know beforehand is so that the celebrities are more likely to show up. But Teen Choice Award viewers are pretty mad anyway and the awards show may want to reconsider their tactics. #TeamInternet has a very loud voice these days. You do NOT want to piss them off.